While supply and demand for gas are responsive to price over a multi-year horizon, they can be very unresponsive to price over a shorter horizon. The US gas market has experienced this with a bang this winter, with front month Henry Hub gas prices surging more than 50% in 2014, before slumping more than 10% in a day in late Feb. But could this volatility happen in Europe. 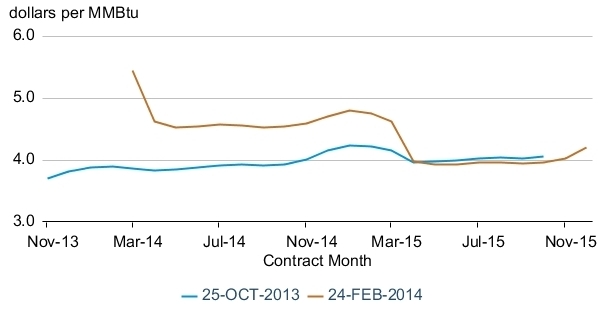 It has been a very mild winter in Europe and gas demand has been soft. 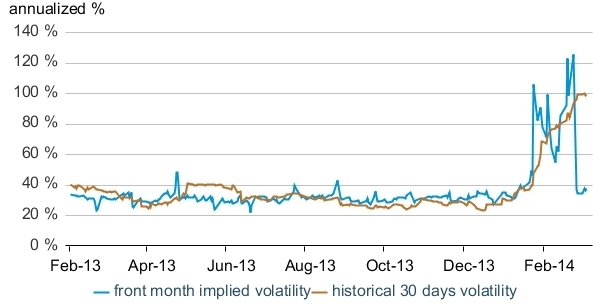 As a result weakness in winter/summer hub price spreads has continued and price volatility remains in the doldrums. Even the threat of Russia flexing its muscles and restricting supply via Ukraine has so far had a limited impact on hub pricing. What is going on in the US? Given structural conditions of oversupply, it is easy to become complacent about the short term inelasticity of gas supply and demand. While supply and demand for gas are responsive to price over a multi-year horizon, they can be very unresponsive to price over a shorter horizon. The US gas market has experienced this with a bang this winter. Henry Hub spot prices surged to over 8 $/mmbtu, levels not seen since the second half of 2008. Front month prices peaked at over 6 $/mmbtu, up more than 50% in 2014, before slumping more than 10% in a day in late Feb. While these price movements reflect a market that has been caught off guard, the cause of the jump in prices is relatively simple. A prolonged cold winter in the US has seen gas demand up around 10% compared to last year and this has sharply eroded gas storage levels. 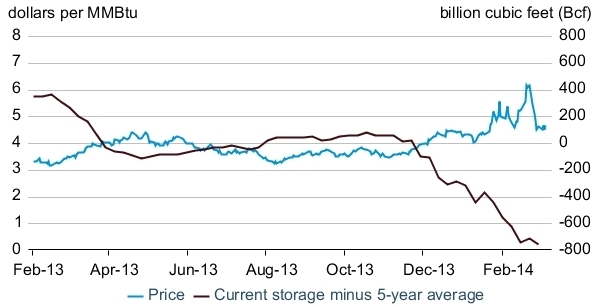 Chart 1 illustrates the relationship between the front month Henry Hub futures contract and the decline in storage levels. Prices have risen at Henry Hub to incentivise further storage withdrawals and other system deliverability. This is a similar to the dynamic that was witnessed in March 2013 when European storage responsed to sharp UK price signals. But unlike the UK example, prices at Henry Hub remained below levels required to attract significant LNG incremental imports (the ultimate backstop for a short US market). In response to the price squeeze at Henry Hub, month-ahead volatility has also surged above 100% from levels below 40% at the start of winter, as shown in Chart 2. However, March implied volatility has declined sharply as the cold snap has eased, suggesting the market is pricing this as a temporary event. The impact on spot volatility (a key factor driving storage optimisation) is even more pronounced. Chart 3 illustrates this winter’s surge in Henry Hub historic spot volatility, relative to monthly ranges back over the last decade. The HH futures curve also points towards the winter price jump being a one season event, with virtually no forward price impact once storage levels have been replenished (i.e. from 2015 and beyond), as illustrated in Chart 4. The fact that prices for specific forward delivery periods can move in relative independence is a sign of market maturity. It suggests that forward prices reflect the expected market conditions in the forward delivery periods rather than taking the price signal from, and broadly moving in parallel to, prompt prices. Could this happen in Europe? There is currently a structural oversupply of gas flexibility in Europe, causing downward pressure on seasonal spreads and volatility. But in many ways Europe is more vulnerable than the US to a similar bout of hub price volatility. Unlike the US, domestic gas production in Europe is in decline, leaving Europe more vulnerable to import constraints. The European cold snap in March 2013 was far less harsh and shorter than the ‘polar vortex’ that has gripped the North American market this winter. The fact that European hub prices spiked to levels required to attract flexible LNG cargoes, whilst HH prices did not, illustrates this higher vunerability. It is a while since there has been a prolonged cold winter across Europe, as opposed to more isolated cold snaps. And the pricing of tail risk appears to indicate a degree of complacency has crept into the market as a result. Russia temporarily curtailing supplies via Ukraine no longer represents the threat that it used to, given alternative supply routes. But a cold winter combined with key infrastructure outages is another story. These events tend to be positively correlated given system stress and could well cause a surge in hub prices and volatility, and a re-pricing of tail risk and the insurance value of portfolio flexibility.